I am once again inspired by Ivy over at The Happy Whisk who has been on a 28 reboot to feel better. Earlier this summer she also set herself a blogging challenge, which also encouraged me to do the same. So thank you Whisk for being such a good example (and an awesome Blogger buddy). The thing I'm realizing is that small, concrete goals are the way to go if I want to make something new stick. My brain likes to tell me (and I like to believe) that I can have a vague idea of what I want and just wing it. Only it doesn't work. I've learned that saying: "I'm going to blog more" doesn't actually lead to me blogging more, but saying (and planning): "I'm going to blog every day this month" is specific and short enough for me to accomplish. So I am gearing up to start a reboot to feel better too. I've been on some lovely walks and bike rides this summer but not as many as I thought I would. My walks or bike rides are usually spontaneous and that spontaneity doesn't happen as often as I think. My thought that "I'm going to walk more this summer" hasn't really panned out because I never actually planned to do it. So I dug this guy out of hiding and I am making a plan to walk. When I lived in the city I walked everywhere - no distance was too far. 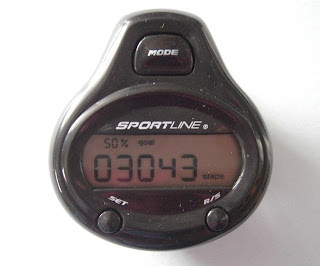 I wish I had my pedometer back then, because I am sure that I often did over 15,000 steps/day. I've calculated that a 45 minute walk for me is about 5000 steps, and in Toronto I would actually walk for hours. I was super active but never even thought about it as exercise. I just loved to walk around and see stuff. In the country I am far less active. Since I turned thirty, I've started to notice changes in my waistline based on that inactivity. They have "the talk" with kids about body changes at puberty, and I think they should have a second talk with the post-thirty crowd about how our bodies change too. My talk would have been a simple statement of fact: "You can no longer eat garbage, avoid activity, and magically stay at your current weight." Past me had it so great and she didn't even know it! So I'm going to schedule activity (same time each day) and some activity goals (# of steps) so I actually have a goal I can accomplish. The magic number of walking seems to be 10,000 steps per day and according to the Sportline guidebook that came with my pedometer, getting to 10,000 steps should be done gradually based on your current steps per day. They suggested recording your step count for three days and then averaging it to find your "start point". Over the past three days I did just that. So in 12 days I should be up to 10,000 steps/day. Hopefully the gradual increase makes it easier for me to maintain. I don't have a treadmill so I'll often be relying on good weather, but I know from my outdoor challenge that even on the rainiest days there are pockets of time when the rain is light enough to get a walk in. This sounds like a fun goal to hit, as well. And coming on fall soon to see all the wonderful leaves. Very cool. And thanks for the nice words, you are too kind. Cheers to us and our 28 day reboots! I will always have nice words for you! Thank you for being so inspiring! I'm looking forward to the walks. Fall is a perfect time. The leaves, the temperature. This should be good! Good Luck, Jen. This looks like a good plan and I think I can do this one too. Good for you, Jen! I'm using my kids as an excuse for the moment - I know, lame. But there's no way that I could have them along on an hour+ walk just for the sake of walking, and I do kind of like my husband, so don't want to leave when he gets home every night. I'm so looking forward to school starting so that I can set some goals and know that I'll have the time for them!